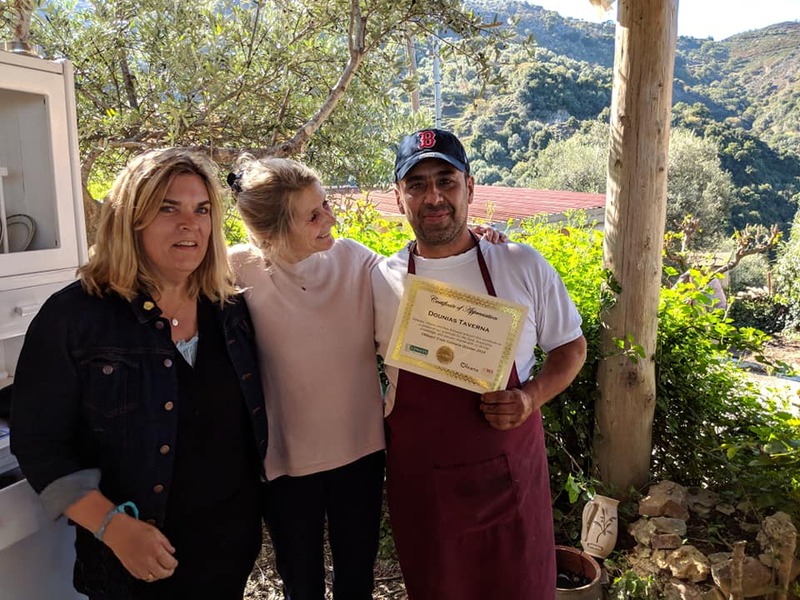 If you were one of the lucky ones to travel to Crete last month with Chef Ana Sortun, Aglaia Kremezi and Oldways, you’ll know that the legends of the Cretan diet are true. It is both healthy and wonderfully delicious. We explored from east to west, from the sea up into the mountains, visiting food and wine producers, artisans, restaurants, cultural sites, small towns and larger cities. It’s one of the great pleasures of traveling—getting to know a place and fellow travelers. There were many wonderful moments to remember and savor. And then there are those “pinch-me” moments—those special times when you just can’t believe how lucky you are to be exactly at a place and at that particular moment. Everyone has their own “pinch me” moments. One of our travelers visited Heraklion’s Archaelogical Museum four times—it was his passion. Some people couldn’t get enough of the cooking demonstrations from Chef Ana or Chef Yiannis Tsivourakis of the Minoa Palce Hotel; others enjoyed the rooftop of the Megaron Hotel, while others spent more time exploring Heraklion and Chania, even visiting Peskesi Restaurant in Heraklion and Kritamon Restaurant in Archanes more than a few times each! If I had to guess just one place that might make it to the top of many people’s list, it would be Dounias, a traditional taverna high in the mountains above Chania. Cooking over clay pots at Dounias Tavern. Unless you see the photos, it’s hard to convey the magic of Dounias. It is quintessential of the old ways. Stellios Trilyrakis and his family have created a place like no other. 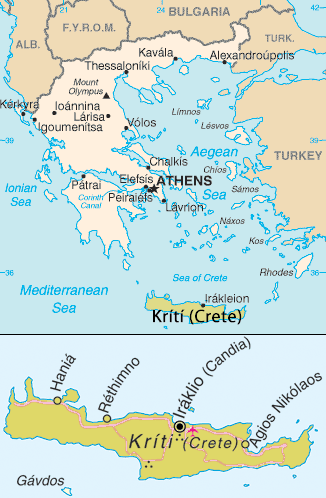 Food is cooked outside in clay pots or in a wood-ﬁred oven. The menu is not known ahead of time, although Stellios is famous for his snails, wild greens and purslane salad, olive-oil fried potatoes, chickpeas and local beans with vegetables, and bulgur trahana with eggplant and his homemade bread. Thanking Stellios of Dounias Tavern with an award, and a Red Sox hat, of course! 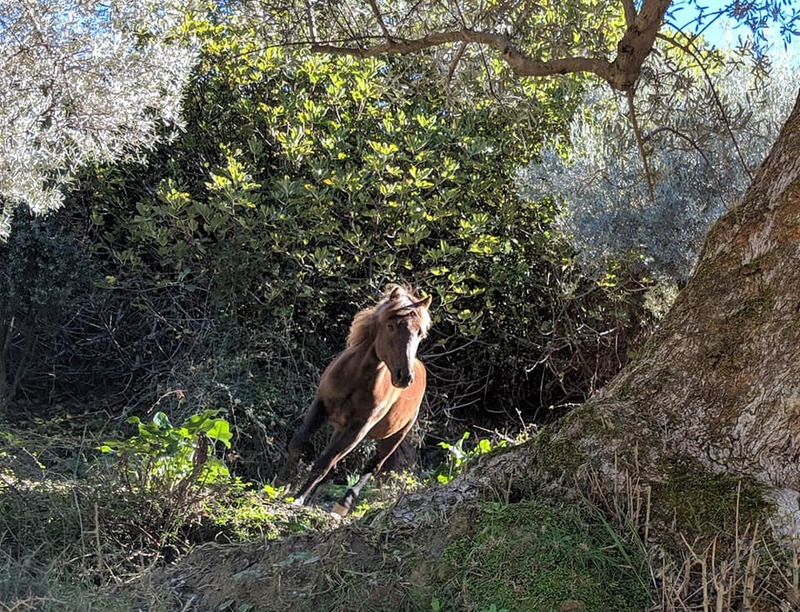 Before we ate lunch, he took us to see his olive trees, garden and to meet his two horses, perched on a terrace of the mountain. Then we all sat down at long tables to enjoy a Dounias Oldways lunch, served with local wine in tin cups. After lots of photos and quite a few hugs, and after awarding Red Sox caps to Stellios and his wife, we said goodbye and set oﬀ for the winding drive down the mountain to the seaside near Chania. Horses in the mountains above Crete. The rest of the trip was magical, too, whether it was visiting Biolea, an organic olive oil producer, just at the time of the harvest and production, or having a tasting and a lunch at Manousakis Winery near Chania. We sat in the winery’s garden on a warm and sunny afternoon, tasting ﬁve wines with a traditional Cretan lunch, and thinking, I can’t believe I’m so lucky. Ready to travel yet? You’re in luck—join Oldways and SRV Chefs Kevin O’Donnell and Michael Lombardi this spring in the Veneto, a spectacular region in northern Italy. Experience ﬁrsthand why the Veneto is known for its rich history and heritage, its splendid wines and ingredients, and its strikingly beautiful cities and landscapes. We’ll be based in two very diﬀerent places—in Verona and in Cison di Valmarino, in the mountains northwest of Venice. In both places we’ll visit food and wine producers as well as cultural sites, and we’ll spend a full day in Venice. And, of course, we’ll have wonderful cooking demonstrations with Chefs Kevin and Michael, along with some incredible meals.